In November 2013, the United Kingdom’s Department of Energy and Climate Change (DECC), and Department of Business Innovation & Skills (BIS) commissioned a team led by Element Energy, and comprising Carbon Counts, PSE, Imperial College and the University of Sheffield, to carry out a study of industrial CO2 capture for storage or utilisation. 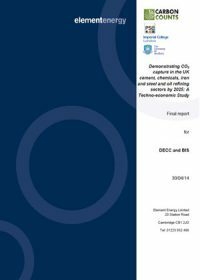 The primary focus of this study is assessing the technical potential and cost effectiveness for retrofit deployment of different CO2 capture technologies to the UK’s existing largest (0.2-8 MtCO2/yr) sources of process CO2 emissions in the cement, chemicals, iron and steel, and oil refining sectors by 2025. Presentation from the 1st Carbon Capture and Storage Seminar for the Regions, Rotterdam, July 2010. 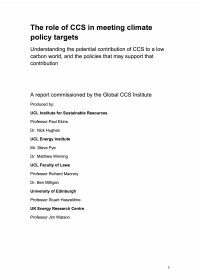 The UK and Norwegian governments engaged Element Energy Limited, Pöyry Energy, and the British Geological Survey to examine the role that a pipeline infrastructure for carbon dioxide capture and storage (CCS) could play in reducing CO2 emissions from both countries. 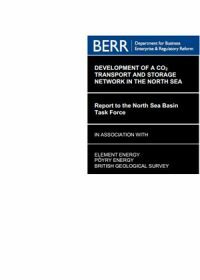 This report, commissioned by the UK Department of Business, Enterprise and Regulatory Reform (formerly the Department of Trade and Industry) on behalf of the UK, Norway and North Sea Basin Task Force, examines possible development pathways for a CCS pipeline infrastructure connecting large UK and Norwegian sources with appropriate sinks in the North Sea and describes the implications for both countries.